Drivers have gotten a break this year with cheap gas, but the lower cost of fuel is an even bigger boon for automakers with big trucks and SUVs to sell. And nobody may be benefiting more than General Motors (GM). The nation’s biggest automaker had a rough first quarter, with problems in Russia, other parts of Europe and South America crimping profits, which came in below analyst estimates. The company's shares were slightly lower in premarket trading Thursday on the disappointing news. But GM had a banner first quarter in its home market, with $2.2 billion in pre-tax profits in North America, more than three times its profit from the same period a year ago. The biggest contributors were pickup trucks and big SUVs — an improbable return to the glory days of the mid-1990s, when SUVs became king of the highway and GM banked some of its heftiest profits ever. The Chevy Tahoe tells the story. Redesigned for 2015, this full-size SUV sells for roughly $50,000, on average, with no rebates or incentives available -- usually a sure indicator of a popular vehicle in high demand. Mileage is a painful 18 MPG, but with gas at $2.50 or so, who cares? During the first three months of the year, GM sold about 21,000 Tahoes, up 33% from last year. Automakers can easily earn $15,000 in profit on each large pickup or SUV, which makes the Tahoe an indisputable winner for GM. The Tahoe has several relatives in GM’s expansive lineup, which demonstrates how big automakers benefit from scale when trends are in their favor. The Tahoe shares many components with the Chevy Silverado pickup, which was redesigned for the 2014 model year and is another huge rainmaker for GM. Common parts help automakers shave costs, especially when they’re under the hood -- more or less invisible to consumers -- on vehicles that seem considerably different. 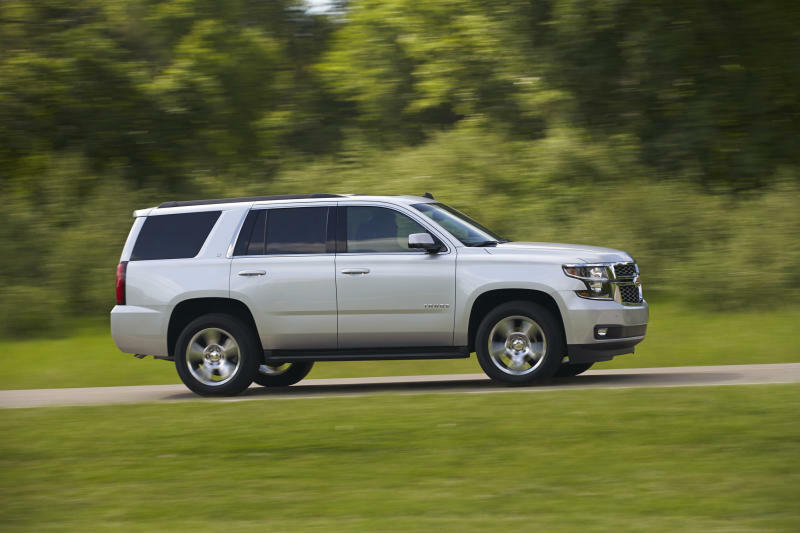 The even-larger Chevy Suburban is a stretched version of the Tahoe. The GMC Yukon and Yukon XL are basically the same as the Tahoe and Surburban, except for the GMC badge. The Cadillac Escalade— average transaction price, approximately $83,000—is a Suburban loaded with bling. Put them all together and GM commands about one-quarter of the pickup market and one-half of full-size SUV sales in the U.S., far above its overall market share of 16.2%. Chuck Stevens, GM's chief financial officer, said trucks and SUVs added $500 million to GM's bottom line in the first quarter. That's more than half of GM's total net income of $945 million. GM has always been a powerhouse in trucks and SUVs, even during the dark days leading up to the firm’s 2009 bankruptcy. But it often built too many of them, forcing deep discounts, no matter how much buyers liked the products. Slimming down through Chapter 11 helped GM solve its overcapacity problem, by ditching 4 of its 8 brands (Pontiac, Saturn, Hummer and Saab) and streamlining assembly lines. The payoff is evident in GM’s pricing power. During the first quarter, average transaction prices for GM vehicles rose 5.2%, according to KBB, nicely beating the industry average of 3.4%. GM is at a fortuitous turn in its product cycle, with a fleet of new SUVs rolling out just as gas prices are plunging and consumers are feeling more comfortable committing to costly vehicles. It has also benefited from a slower-than-normal rollout of Ford’s (F) new F-150 pickup truck, a perennial bestseller, which has helped sales of the Silverado. GM still has problems, most notably, the likelihood of government fines or lawsuits relating to the safety and recall scandal that dominated the company in 2014. Though much of that is now in the past, analysts think fines and litigation could still cost GM several billion dollars. The other blot is GM’s European division, which is in the midst of a turnaround but remains unprofitable. There’s always the risk that gas prices could shoot back up, torpedoing sales of big vehicles. In 2008, when gas prices hit $4 and buyers flocked to smaller cars, GM, like its crosstown rivals Ford and Chrysler (FCAU), had few offerings able to compete with the best from Japan and Europe. GM execs insist that’s not the case any more, since the company no longer neglects the lower end of its lineup. For now, however, GM doesn’t have to prove it.